Full access to regular question database updates. 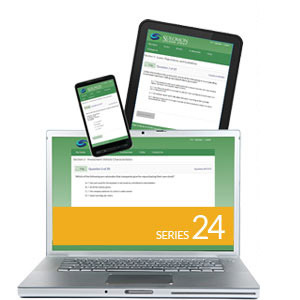 Sample a FREE demo of our Series 24 Online Exam Simulator here! Thank you so much and special thanks to the product you put out!! I did not know about Solomon a year ago when I took the Series 7 and I used another company's material. I did not pass the 7 first time and I was extremely nervous about the 66. However your product was wonderful and thanks to you guys I passed the 66 on my first try!!! Can't thank you enough!!! I passed the Series 50 on the first attempt thanks to Solomon's materials. Although the questions on the exam were much more difficult and complex in structure and format than the Solomon practice exams, the study materials & practice exams did enforce the concepts that the actual exam was testing. Thank you Solomon!! !